Read the minutes of all our meetings on the "About Us"page. The second work party was held on Saturday and was another great success. A full report and pictures are on their way..... watch this space (or see the pictures on our Facebook group page). 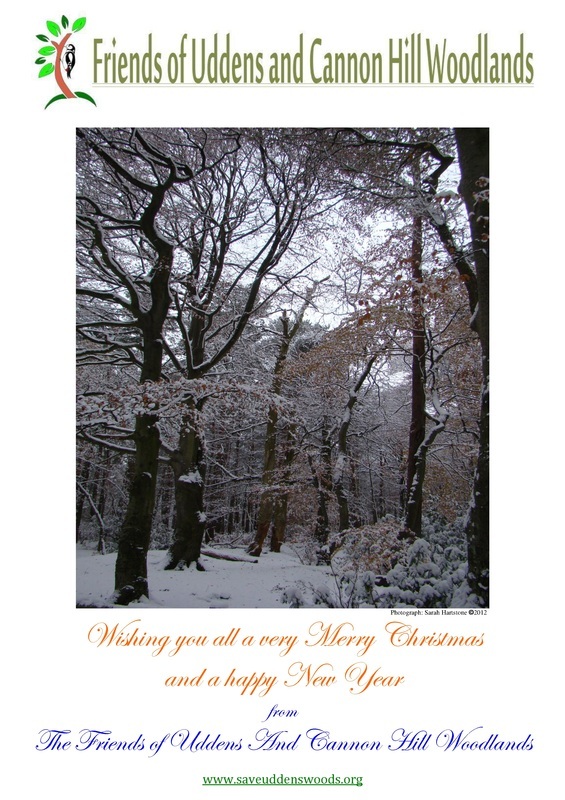 In the meantime have a read of the latest Avon Heath Newsletter that gives us a mention about the February Work Party. Following February’s amazing work party at Cannon Hill woods where 55 people turned up to work with Dorset Countryside Ranger Service, we are pleased to announce we will be holding another one next weekend. If you missed last months and haven’t been to the woods recently, have a look at the photos in the gallery. Saturday 9th March 10am to 3.30pm or whatever time you can spare! This time we will be working in partnership with the Forestry Commission who will be on site to provide training, tools and supervision. We will be once again concentrating our efforts on the south side of the A31 (although we are also in talks with the FC about some exciting plans for the larger north section in the future). Tasks will include installing 2 picnic tables, putting up bird boxes, clearing some of the fallen timber and brash to build habitat piles and possibly burning some of the invasive species. It is still uncertain whether we will be able to continue with the Rhododendron removal, as the foresters are looking at the best control method for it. Rhododendron, as well as being an invasive non-native shrub is also a carrier of Phytophthora Ramorum (sudden oak death disease). It is possible that they will have to spray it with herbicide instead. Hot & Cold Drinks, Biscuits, Tools & Gloves provided, but if you have a favourite pair of gardening gloves you may want to bring them)….. Oh and of course any cake donations would be gratefully received!! Don’t wear your best clothes, but dress for the weather and we suggest stout footwear. It is always handy to have a rough idea of numbers so if you are coming it would be great if you could let Michael know by emailing him at michael.gorse@btinternet.com or calling him on 07783 692181. If however you just decide to come down on a whim, then that’s fine too…… or even to go for a walk and see what’s going on if it’s really not your thing. Spring will soon be with us to transform the woods and the water levels are slowly going down! Birds to listen and look out for at the moment are goldcrests, crossbills, jays and black caps. We hope to get a newsletter out later this month with some exciting new plans for the future. The day was an amazing success with 55 volunteers attending. We knew there were strong feelings for the woods, but for that many people to be available and prepared to give up their free time was really special. We had a real mix of ages spanning 8 decades and although there were no doubt some aches and pains the next day, I'm pretty certain everyone went home with a real sense of achievement. More than 170 man hours went into the day, which is the equivalent of a full timer working there for more than a month! Although the Ranger Service only have responsibility for the Castleman Trailway, the Forestry Commission had kindly given permission for us to have a bonfire and clear some of the invasive Rhododendron. This was fortunate as with the numbers we had, light work was made of the Bridleway and an enormous amount of Holly, Rhododendron and brash cleared keeping the team on the bonfire busy all day. A large section of track was scraped back gaining a good metre of track. Probably the least fun task, but with 8 people at a time with shovels it didn't take long to clear a good length of it. To the ladies who made plenty of excellent cakes to keep us going. Vera , Jill and Michael for manning the refreshment station all day. Waitrose in Ashley Road, Parkstone for kindly donating the refreshments. Paul Jones Trailway Ranger, Dorset Countryside for supervising us and providing tools and knowledge. Councillor Janet Dover for promoting the event in her newsletter and finding time in a hectic schedule to lend a hand on the day. and of course everyone who came along to help. Have a look at the photo album here to see what we got up to...... or even better go down to the woods and have a look for yourselves!! 1. Path work - We are keen to sort the 3 areas of bridleway (one by the gate to the bridge) which are currently flooded or very muddy. This work will be done in conjunction with the Rangers. Unfortunately it will have to wait for the summer as it is not a job that can be done while the ground is sodden. 2. The Forestry Commission are keen to run some tasks with us which could include work on the burial mounds and bridleway (north of the A31) and possibly more clearance of Rhododendron and brash. 3. Another possibility is siting bird boxes. Have your say! What would you like to see happen with the woodland at Uddens and Cannon Hill? The more we can do to put our "communities stamp" on it the harder it will be for anyone to take it away from us! The main council chamber was being used for staff training. Therefore this meeting was held in a small committee room. Approximately 30 people including the majority of our committee attended this meeting. Due to the size of the room we are all somewhat cramped and latecomers were left with no option but to stand. Although members of the public are allowed to speak at all council meetings as long as 14 days’ notice has been given we decided after consulting with Cllr Dover and our consultant Mike Hersh that it would be advisable for us to say nothing at this meeting. Instead, Cllr Dover agreed to make representations on our behalf. Although Cllr Dover is not a member of this Community Committee she was able to speak in her capacity as our County Councillor. I have summarized some of Councillor Dover’s representations below. I wish to speak to you today about the Uddens Forest site at Stapehill, that is in the Agenda report today as a proposed Gypsy and Traveller Transit site. The site is owned by the Forestry Commission and most importantly in the GREEN BELT. In January 2012 DCC applied for and received agreement for a grant from the Homes and Community Agency of some £1.75 million to enable them to construct a Gypsy and Traveller Transit site in Uddens Woodland. The site was to contain 25 pitches and associated utility buildings etc. A plan of the proposed site was submitted with the application. All this was done without my knowledge. When I discovered that this had happened, as the County Councilor for this area I immediately informed my residents about this proposal. There was a huge public outcry to this news. The Friends of Uddens and Cannon Hill Woodlands was quickly formed. The Friends of Uddens and Cannon Hill Woodlands is a diverse group of residents, local business owners, cyclists, horse riders, dog walkers and nature lovers who strongly believe it is wrong to put a development of any kind in the woodland. A large Petition was raised by the Friends of nearly 6500 signatures and was presented to DCC 26 April 2012 and copied to EDDC shortly afterwards. DCC promised to look at other sites in Dorset in the meanwhile, BUT declined to remove Uddens site before the process involving consultation and the Joint Development Plan Document report from the agents working for the Councils had been published. You have this document on your agenda today. There are major and substantial problems with the Uddens site. This site is within the green belt and as such is sacrosanct. We must protect our precious Green Belt in East Dorset! There is a lack of balance between the size of this proposed site and the existing community. There is only a small community of some 15 dwellings accessed from this part of Uddens Drive. The proposed site would vastly outnumber the local residents. On the subject of Landscape and amenity of area, Cllr Dover went on to say. Uddens Forest is used as a recreation destination by residents from Colehill, Ferndown and surrounding areas and wider a- field it is also home to the very well used Castleman Trailway. Over time the introduction of a transit site will cause inevitable damage to the woodland and its biodiversity, beyond the site itself. There is a considerable possibility of loss of livelihood, for example the Old Thatch Public House, Stapehill Farm, Stapehill Abbey, and the Arena Business Centre. Farrow and Ball an international company and amongst East Dorset’s largest employer has expressed concerns over this proposal. Chairman the list goes on but I'm sure the council members will be aware of all the companies located in this area. Cllr Dover concluded her statement by saying. On behalf of the whole committee and all affected residents, local businesses, and the Friends of Uddens and Cannon Hill Woodlands, who have had their lives blighted by the uncertainty of this protracted process to find a Gypsy and Traveller Transit site in Dorset. I ask that this committee agree that NO further action will be taken in relation to the Uddens site and that the site is NOT taken forward to the next stage. Failing that, that this Committee agrees a firm timetable to be produced to give some certainty of the final stages of this process and most importantly, when this process will be concluded. Councillor Dover finished her submission by thanking the chairman. Cllr Dover's speech was listened to with interest and I feel that all councillors present took on board her points. Councillor Spencer Flower (chair of the meeting) indicated that dropping the Uddens site was not an option at this stage as the consultation must be seen to be following the correct procedures. that this funding could be used for any transit site in Dorset and is not specifically tied to Uddens. Linda King, the council officer who is leading the consultation process for the whole of Dorset presented the report compiled by Peter Brett Associates LLP. It was pointed out by Ms. King, that this report only contained a summary of remarks made by those of us who responded to the consultation. She also pointed out that many of the remarks were contradictory i.e. some people had said the site was not available for development, other respondents had stated it was available. Unfortunately there was no way of knowing who had sent them in (without returning to the primary information). She went on to say that respondents to the consultation have suggested some 200 new sites not formally considered in the process. Some of these will have to be rejected at the ‘analytical desk top’ stage; the rest will have to go out to consultation, presuming the landowners are happy for their land to be used for this purpose. Linda informed that there were 10,000 responses to the consultation and assured us that none were discounted despite some rather ‘rich’ responses. Although our petition was recognised, it did not figure in the official consultation report as it was handed in after the consultation was closed. However it was accepted by the meeting. She went on to say, the current ‘needs’ assessment is based on the scrapped Regional Spatial Strategy and the figures were always an issue. For this reason Government policy now says that Local Authorities must do their own ‘needs’ assessment, as evidence indicates that the figures maybe less than those we are currently using. The following is copied from the official documents supplied to councillors. The original budget to produce the DPD was £228,000.The bulk of this, some £164,000, was grant-funded from the Dorset Strategic Partnership and the South West Regional Improvement and Efficiency Partnership Innovation fund. This was a one-off payment. The Consultation Report recommends that the revised needs assessment and that the alternative sites assessment and subsequent public consultation are carried out. In light of these new stages, a revised project timetable will be required and publicised in respect of the DPD‟s production. This additional work has budgetary implications for the commissioning councils. However this can be met out of existing budgets. The estimated cost to update the needs analysis is about £50,000 of which the individual councils would need to contribute up to £6,250 each. (6) Structured community engagement with the settled and travelling communities. It may be possible for a significant portion of the information gathering from local authority sources to be carried out by officers on the DPD Officer Group, but the work associated with community engagement will need to be carried out by independent consultants specialising in this field to ensure the information collected is credible and sound, and will stand up to examination when the DPD comes before an Inspector. If this split of work can be agreed, then it is likely that the total figure for needs analysis would be reduced from the initial estimate of £50,000. There were some general comments by Councillors with reference to the responses to the consultation. It was recommended that the committee accept the report. This they duly did and it was voted unanimously to accept the recommendation. There was also recognition of the uncertainty and that this should be removed as quickly as possible. Linda King agreed and stated that some of the consultation on the number of sites required and the research into whether any of the 200 newly proposed sites are suitable could be carried out concurrently thereby saving time. It was assumed that the next round consultation will be conducted late 2013. Although we did not get Uddens removed from the process, I feel we achieved as much as we could reasonably expect from this meeting. We must not forget that there are Councillors on this committee who has other proposed sites in their wards, which are causing concern to their electorate. Uddens was the only site specifically mentioned at this meeting. It was apparent all present appreciated the problems that will because to both the local community, local businesses and the users of the Castleman Trailway should this site be developed. We believe that it is important we show both the council and the Forestry Commission that the local residents have a commitment to this woodland. To this end, in the New Year, it is our intention to carry out two joint working parties with the Dorset Countryside Ranger Service and the Forestry Commission. The intention is to undertake a project in the Uddens side of the woodland and a further project in the Cannon Hill side. It is important that we carry out work in both sides of the woodland, as although the threat of gravel extraction from the main area of the woodland has receded, there is still a possibility of this proposal raising its ugly head again sometime in the future. Of course both these projects will depend entirely on whether we receive the support of local residents. Without your help and support neither these projects will be possible. We will be putting more information on the website and in our newsletter in the New Year. If you would like to be involved, please contact me as I have now started a list of those willing to volunteer. The Council has finally published the results of the consultation. You can read an overview on the Dorset for You website here . Page 42 of the appendix (below right) contains the information directly referring to the Cannon Hill Uddens site. The report obviously needs studying before we can give our views and future plans. The Forestry Commission have asked us for our help in informing people about a nasty plant disease affecting parts of Cannon Hill. Phytopthora ramorum, is a fungus that is a pathogen and will infect and kill a number of tree species - contamination can occur from rhododendron plants. The FC will be shortly fencing off the contaminated area adjacent to Uddens Drive and displaying notices (see below), as transfer can also occur via peoples boots etc. The course of action has yet to be confirmed, but will probably result in the removal of the rhododendron plants and possible burning on site to minimise the spread of the disease. More information on this disease is available on the Forestry Commission website. We hoped by now that the council would have declared their intentions for the next stage of the process. Unfortunately this has not been the case, with more responses from the public than expected cited as the reason for the delay. We have been challenging this delay and expect to hear from them shortly! Many thanks to those who gave up time to man the survey from 8am to 6pm each day. Also a big thank you to to everyone who stopped to complete the survey. Unfortunately due to lower than hoped volunteer numbers, a few people slipped through the net. We will of course publish the results when we have finished compiling them. 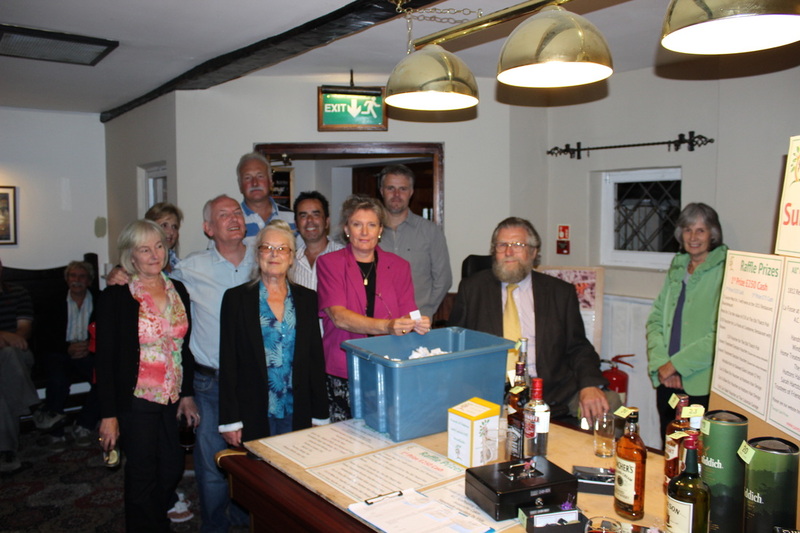 The draw for our summer raffle was held at the Old Thatch Country Pub on Saturday the 25th of August. Councillor Janet Dover drew the tickets for the 28 prizes, in this, the first raffle to be held by the Friends. A list of prizes and prize-winners can be found on our website. The committee and friends of the organisation have worked tirelessly, selling tickets and sourcing the many excellent prizes. Special thanks has to go to Councillor Janet Dover for agreeing to draw the tickets. Andy Hartstone for all the hard work he did behind-the-scenes and without whose help this draw would not have been possible. 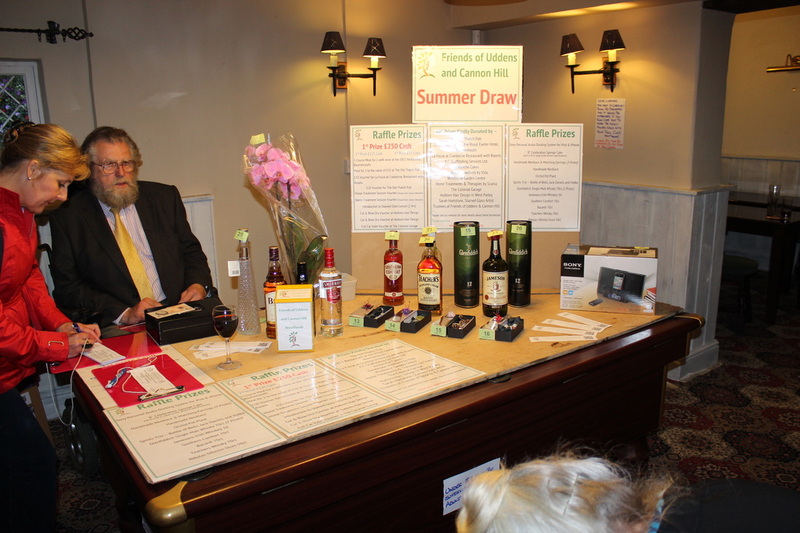 Mark Lindsell, the landlord of the Old Thatch Country Pub and Restaurant, who not only donated some outstanding prizes, but he also gave us free rein to hold our raffle on his premises on a busy Saturday night. I would also like to personally thank everyone who purchased tickets for this raffle and the businesses who were so generous with the prizes. Their support is what made this raffle so successful. The raffle raised over £1400 (the final figure is not yet in). This money will be a great help in our fight to preserve this much loved and used area of woodland from any inappropriate development. We are still waiting for East, Dorset District Council to make public Baker Associates recommendations as to which of the proposed sites in the Dorset-wide Traveller and Showpeople Site Allocation Joint Development Plan should go forward to the next round. We sincerely hope that both East Dorset District Council and Baker Associates take notice of the six and a half thousand people who have signed our a petition requesting Uddens be removed from the process. It should be noted that that a proposed site in Bournemouth was removed from the process after the council received a petition containing 1000 signatures. Similarly, a proposed site in Christchurch was removed after their council received a petition containing 1600 signatures. With a petition against this proposed site in the Uddens woodland signed by 6500 people, we are amazed at the site has not already been removed. Should East Dorset District Council decide not listen to the local people's wishes, the money raised by this raffle, added to our existing funds will enable us to put up staunch resistance to this and any other inappropriate development in this woodland. Michael Gorse and Andy Hartstone had a meeting with Mark Street (Land Agent for the Forestry Commission) and Andrew Norris (the Forestry Commission's Community Manager in Dorset) in the ancient Verderers' Hall in Lyndhurst. A copy of the petition was handed over (which now stands at 6,446 names) and was well received. Mr Street explained that no Forestry Commission land could be disposed of without ministerial approval until the government announces it's response to the Independent Panel on Forestry Report which coincidentally was published on the day as our meeting. The government response is not due until January 2013. It was good to meet you and Andrew last week. The petition you presented us, which includes over 6000 signatures, certainly identifies the strength of feeling that exists in the community in respect of this area of Forestry Commission managed woodland being developed as a Gypsy Transit site. When we met I explained the current position regarding the Public Forest Estate especially in relation to disposals and non-forestry activities. We now have the Independent Panel's Report and will be working with the Government to assist wherever possible with their response to the recommendations in the Report. I have not received any communication from the County Council about this site for a number of months and any attempts to recommence negotiations in the next six months will require me to submit a report to our Directors and senior DEFRA officials. The existence of the petition presented to us will be a central part of this report. Should we obtain an update on the consultation process then I am sure we will be in touch on this matter again, in the meantime please continue the good work in and around the area use Andrew Norris as your main contact in the Forestry Commission. I made an enquiry this week through David Jenkins, Chief Executive of Dorset County Council, on the latest position regarding Uddens Forest . This was following the petition to DCC in April and the County Councils promise to look for other sites in Dorset. David Jenkins has sent me the following update from Dave Ayre this week and has agreed to me sharing this with you and your residents group. I am sure that your group and others associated with your group will wish to see this latest update. Bakers Associates, the planning consultants, carrying out work on the Dorset-wide Gypsy and Traveller Sites Development Plan Document are coming to the end of their analysis of the responses to the public consultation and I am advised that they hope to be able to provide an initial update to officers of Dorset Councils during June. On the 20 June the Dorset Environmental Managers' Group, which includes the more senior Planning Officers in Dorset Councils, will receive an update on progress from Lynda King and will begin to firm up on the likely next steps. We are expecting there to be an Alternative Sites Consultation whereby any additional sites put forward in response to the consultation will be subject to public consultation. However, it should be noted that these sites will first need to be evaluated against the criteria applied to the sites that were the subject of a first round of consultation. A report will be prepared for the Member Liaison Committee which oversees this and other cross-cutting planning issues which is currently chaired by Robert Gould and I would expect there to be a confidential briefing of Members of Dorset's Councils on the alternative sites consultation before the information is presented to open Committee. In the meantime, I believe there is likely to be some soundings with Chief Executives and leading Members in the respective Authorities so that any lessons from the first round of consultation can be learnt and applied to the alternative sites consultation. When all of the sites have been subject to public consultation and the responses have been evaluated the Districts, Boroughs and Unitaries will consider which sites they would wish to include in the Preferred Options report. This will be the stage at which it would be appropriate for the County Council to consider its options with regard to the grant offer. In the meantime, we have been contacted by the Homes and Communities Agency and will be meeting them at their Bristol office on the 25 June. At this meeting we will update them on the progress of the DPD and will be seeking reassurances from them that the initial grant offer can remain in place while Dorset Councils go through the due process of the Development Plan system. Letter from our chairman explaining the outcome. As you are aware, we were going to put a motion before Dorset County Council in a attempt to have have the Uddens site removed from the Gypsy Traveller Joint Development Plan. In discussion with Councillor Janet Dover and Mike Hirsh it was decided that we should attempt to obtain cross-party support for our motion. To this end Janet approached Councillor Spencer Flower, leader of East Dorset District Council and a local County Councillor. Councillor Flower agreed to second the motion on the condition that certain changes were made. Sadly, the reference to the removal of Uddens from the process had to be removed. After considerable negotiation and amended motion was agreed (See File Below). Although it would appear we have failed to achieve what we set out to do, we all feel that we have made great strides in our battle to have Uddens removed from the process. Along with seconding our motion Cllr Flower also accepted a copy of our 6000+ signature petition on behalf of East Dorset District Council. He has assured us that although our petition was addressed to DCC ,should Uddens come through the first stage process it will be taken into consideration when East Dorset District Council make their decision on which sites they intend to take forward to the next stage. We believe receiving cross-party support, the recognition of our petition and most importantly, the acknowledgement of the concerns of local commerce to be a substantial step forward. In our discussions Councillor Flower asked me to forward copies of any communications I receive from companies on either industrial estate expressing concern at this proposal. Should the District Council go forward with a planning application for the Uddens site at a later date it would appear that they would have little success. The Forestry Commission have also agreed to accept a copy of our petition. Once Uddens has been removed from the process it is our intention to attempt to either purchase or lease this piece of woodland so we can develop it for the benefit of the local community and those working on the industrial estate, this would also protect it from any future unwelcome developments. With this in mind we are at present setting up a bank account and registering our organisation as a charity with HMRC. We also intend inviting people to join the the Friends of Uddens Woodland, we're are in the process of designing the membership card and setting up the necessary database. We intend to investigate various fundraising initiatives. We feel is vital that we both put the organisation on a proper footing I have sufficient funds to be able to retain the services of Mike Hirsh and any other professionals we may need to employ in our fight to stop this most unwelcome plan. I hope this is brought up to date as to where we are. I will of course keep you informed of any future developments. Should you have any questions/ideas please do not hesitate to contact me either through this website or by telephone. 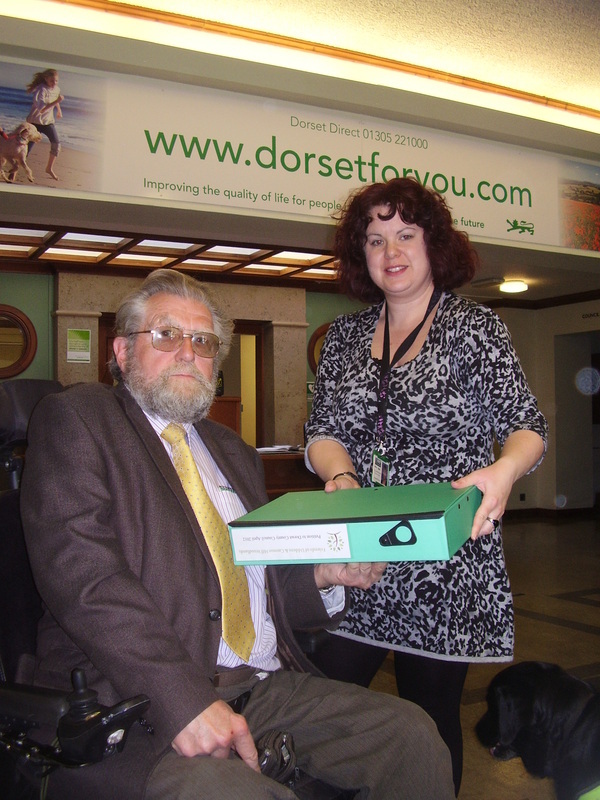 Michael Gorse and Lin White went to County Hall in Dorchester to hand in our petition of 6086 signatures. More detail will follow, but Michael and the committee would like to thank everyone who has made this amazing result possible. Michael also met with Councillor Spencer Flower (Leader of the Council) and handed over a copy of our petition. Councillor Flower promised he would place our petition before the council if the matter came up at EDDC. Many of you may have read in the press that there is a new planning policy for traveller sites. You may have gain the impression that this new policy would render the proposed site at Uddens redundant as the site is Green Belt. Unfortunately, according to our planning consultant. This is not the case. Last evening we held our committee meeting at which our planning consultant Mike Hirsh attended. Mr Hirsh was until recently the chief planning officer for East Dorset Council. He is now both advising us and will speak on our behalf at the County Council meeting in Dorchester on 26th April. It is Mr Hirsh's opinion that this new policy does not affect the proposed travellers site at Uddens in anyway. The story in the press originated from Paragraph 14, of the Planning Policy for Travellers Sites. “Traveller sites, (temporary or permanent) in greenbelt land are an inappropriate development. Therefore, all a Council has to do is to specify a need for a traveller site and then they can place it within the Green Belt. I appreciate that these two statements may appear contradictory. That's not surprising. It is a government document! What, this new policy does do, is to stop travellers from purchasing greenbelt land, placing caravans on it and then apply for retrospective planning permission. The Council can now say that, that is inappropriate development. I hope this makes this somewhat contradictory policy a little clearer. What does this mean to our fight. Basically we’re in the same place today as we were last week. That is why the survey we are conducting on Easter Monday (9th April) is vital. It will provide us with evidence of usage of this area of woodland by the public, during a busy period. The statistics we gain from this survey will then be used, along with statistics we gain from the survey we held in January, by Mr Hirsh in his submission to the County Council, on the 26th April. If you would like to volunteer or would like a little more information please do not hesitate to contact me. A meeting organised by Colehill Parish Council was held to bring residents up to speed on objections that have been submitted on our behalf. Not surprisingly considering the strength of local feeling on the subject, the large hall was full to capacity with standing room only! and Traveller site at Uddens. Hilary Chittenden, Chair of the Environmental Theme Action Group, explained in detail why that group totally opposes the proposal and highlighted the potential harmful affects upon the flora and fauna of the local countryside as well as the serious loss of countryside access for the public. Colehill Parish Council, the residents of Stapehill, ETAG and Dorset Wildlife Trust have all condemned the idea of a transit site at Uddens. County Cllr Janet Dover spoke in support of the objections and raised questions about the manner in which Uddens had become a potential site in the first place. David Ayre from DCC, who has responsibility for Countryside Development and particularly Gypsy sites, explained the process which will take place before any site can be accepted but also admitted that there was considerable opposition to the proposal. He was thanked for having the courage come and face almost unanimous opposition. residents for turning out in such numbers to voice their feelings. Cllr David Packer of EDDC and Colehill Parish Council encouraged all present to make their feeling known to the District Planners by writing to EDDC, the body which ultimately would decide whether or not such plans went ahead. See the Letters and Site Plans page for the objection letters submitted on our behalf.